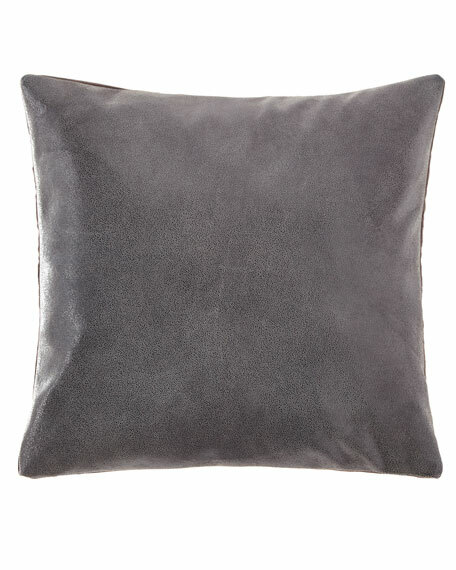 EXCLUSIVELY AT NEIMAN MARCUS Multi-patched pillow. Cord edge finish. Polyester/rayon. Spot clean. 20"Sq. Made in the USA of imported materials. Textured decorative pillow. Viscose/polyester. Feather insert included. Dry clean. 16" x 22". Made in the USA of imported materials. EXCLUSIVELY AT NEIMAN MARCUS Handcrafted pillow in croc embossed pattern. Polyester. Feather fill included. Hidden zip closure. 22"Sq. Dry clean. EXCLUSIVELY AT NEIMAN MARCUS Handcrafted pillow in croc embossed pattern. Polyester. Feather fill included. Hidden zip closure. 22"Sq. Dry clean. Made in the USA of imported materials. Jacquard sham with beaded trim around edges. Polyester. 27"Sq. Made in the USA of imported materials.